Rachel's post about these marshmellow animals had me gushing. They are truly some of the cutest, most creative little things I've seen in sometime. 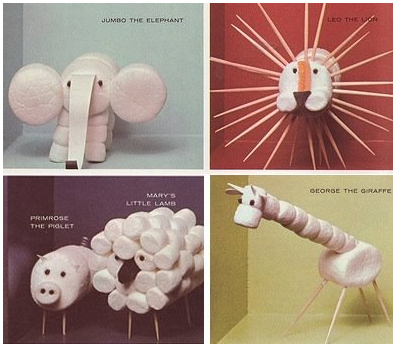 I cannot think of a more enjoyable craft to share with my children and feel quite certain I will enjoy making a marshmellow pig as much as they will...oh, but that lion! I wonder if they would be fun to make at a "barnyard" themed birthday party...that would keep the kiddos busy for more than 5 minutes! Based on the pictures, it looks like all you really need are: toothpicks, two sizes of marshmellows and a Sharpie pen. A few pipe cleaners and scraps of paper for embellishments wouldn't hurt either!